Steve Cram says Laura Muir has reacted "brilliantly" to her disappointments in 2014 to become Scottish athlete of the year in 2015. Muir won the award ahead of fellow nominees Eilidh Child, Lynsey Sharp and Robbie Simpson. It capped a fine season overall for the 1500m runner, who finished fifth at the World Championships. "She could easily have taken the not-so-good experiences and struggled to come back," said Cram. 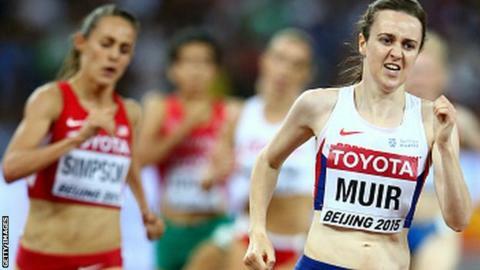 Glasgow 2014 was an unhappy experience for Muir as she stumbled out of the 1500m final when in contention for a medal after being clipped by a rival. Upset by the incident, Muir withdrew from the heats of the 800m and a few weeks later the Scot, who is coached by Andy Young, failed to progress from the heats of the European Championships in Zurich. "She made an impressive comeback from 2014, when the Commonwealth Games were a big disappointment," said Cram, who won 1500m silver at the 1984 Olympic Games in Los Angeles. "She's a tough cookie, Laura. After her disappointment in Glasgow, I remember sitting with Laura and Andy in the stand and saying 'it isn't always going to be like this. You have to take the positives and learn from it'. "She did that brilliantly and had a great year." Muir has been in excellent form in 2015. In addition to that fifth-place finish in the 1500m at the World Championships in China, she became the first Scottish woman to break four minutes in the 1500m when she finished fifth with a time of 3mins 58.66secs in the final of the Diamond League event in Monaco in July. Muir had won the same event in the Oslo Diamond League the previous month. "Laura was fifth in the World Championships. Sometimes a result like that is phenomenal against the competition she was up against," Cram told Scottish Athletics TV. "The women's 1500m is probably the toughest event in the world at the moment in terms of overall depth." Cram also says he has been heartened by the emergence of a new wave of talent coming through in Scotland. "It's been great to see what's been happening in Scottish Athletics," he said. "Watching some of the ones coming through - Callum and Derek Hawkins, Beth Potter, Laura, Chris O'Hare - there's been a real upsurge in the quality of people competing for Scotland. "You've got your leaders there like Eilidh Child and Lynsey Sharp, but it's been great to see that quality."